Heroes of Black History: Biographies of Four Great Americans (America Handbooks, a Time for Kids Series) (Hardcover) | Let's Play Books! Young readers learn about the life of Harriet Tubman--born a slave around 1820, she escaped to the North, but returned to the South nineteen times as a conductor on the Underground Railroad to lead 300 slaves to freedom. An incredibly gifted athlete, Jackie Robinson endured taunts, slurs, and death threats when he broke the color barrier in Major League Baseball in 1947. Rosa Parks refused to give up her seat to a white man on an Alabama bus in 1955 and paved the way for a Supreme Court decision that declared segregation on Alabama's public buses was unconstitutional. On January 20, 2009, Barack Obama took the oath of office as our country's first African American president. Illustrated with a dynamic mix of photographs and illustrations, the biographies of these Americans delve deeper than their accomplishments to reveal details on their childhoods, early experiences, schooling, family life, and more. Sidebars about related topics--Underground Railroad routes, sports firsts, the Harlem Renaissance, and more--give context and additional insights for young readers. 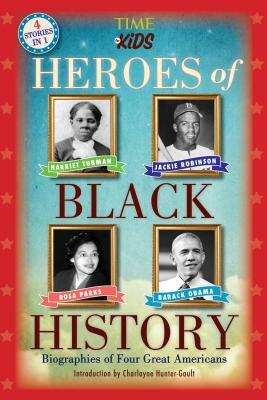 Heroes of Black History also gives readers a timeline overview of three centuries of African American history, beginning with the slave trade, touching upon the formation of the NAACP, the civil rights movement, the March on Washington, and other pivotal events, up through the beginning of the Black Lives Matter movement. Brief profiles of more than twenty additional heroes of black history, a glossary of key terms, and a detailed index are also included in this comprehensive book.